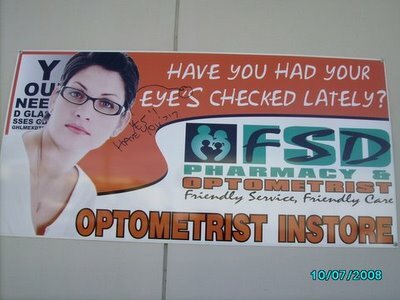 Had your eye’s checked lately? Another day, another abused apostrophe. It’s getting so commonplace that I normally wouldn’t think to photograph it and submit it, but this one has some witty graffiti that I thought was worthy. It is a sign from Toowoomba, Queensland, Australia. Anyone notice the eye chart behind her head? Subliminal messaging perhaps? Bonus points for using a font similar to that of The Simpsons?